Bring a pan of water to the boil then salt it lightly. Wash and thickly slice 450g of small to medium-sized potatoes. Lower the sliced potatoes into the boiling water then leave to cook for about 10-12 minutes until you can effortlessly pierce them with a skewer. Drain them carefully and set aside. Cut up a handful of chard: the leaves into large pieces, and the stems into short, manageable lengths. 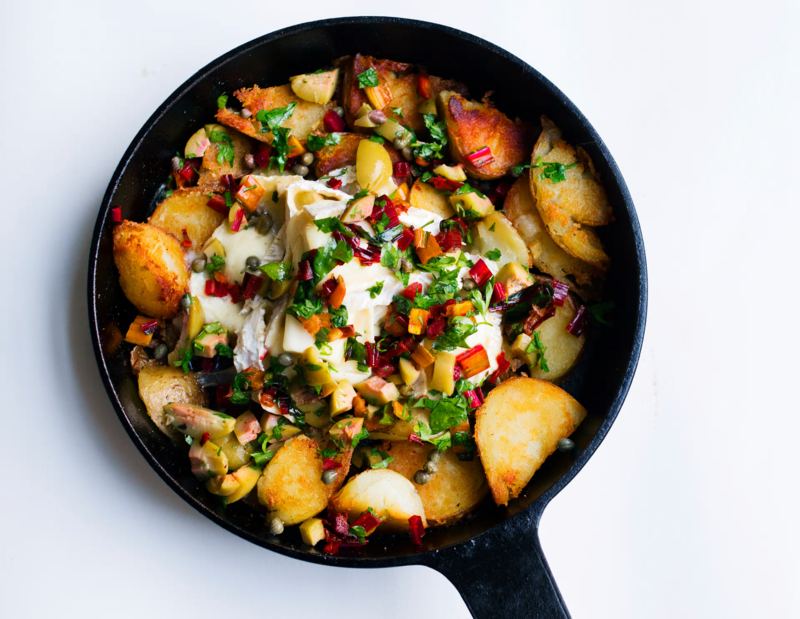 Warm 3 tbsp of olive oil in a shallow pan, then introduce the potatoes, leaving them to cook and crisp lightly, turning them over every now and again so they colour evenly. Just as the potatoes are crisping, tuck the pieces of chard in amongst them to warm for a minute or so. 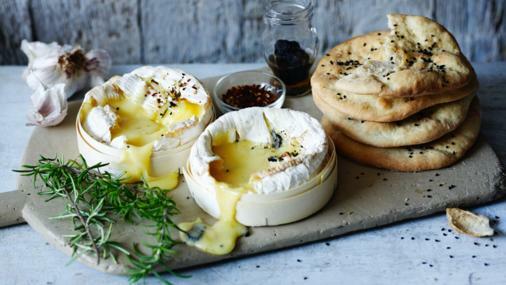 Thickly slice 250g of soft cheese such as Tunworth, camembert, brie or other, similar cheese and place it over the potatoes. Scatter the olive and parsley mixture over the surface, leave for a moment or two for the cheese to melt then divide between two plates. Serve with bread, something crisp and white. Enough for 2. Boil the potatoes (whole , unpeeled) until soft in the centre. Chop into ½ inch cubes. Meanwhile chop the onion and sweat in half the olive oil until soft. Remove from the pan. Add the bacon lardons to the pan and fry until just crisp. Remove from the pan. Add the rest of the olive oil and fry the potatoes to give them some colour. Cut the ready rolled pastry into a 10 inch circle. 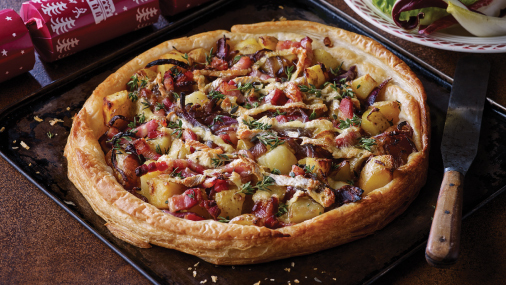 Place the pastry on a baking sheet and top with the potatoes, onions , bacon lardons and Tunworth cheese leaving an inch of pastry around the edge. Sprinkle with some thyme leaves and bake for 15-20 minutes until the pastry is crisp. Remove all the packaging from the cheeses and place back in the box. Place the lid under the base for extra support. Score the top of one cheese in a lattice pattern. Using a spoon, push the crushed garlic, rosemary and chilli flakes into one of the cheeses. Push the truffle slices into the other cheese. Place onto a baking tray and bake in the oven for about 30 minutes, or until the cheese starts to go wobbly in the middle. Remove from the oven and allow to rest for five minutes. Serve scooped up with the flatbreads.